Escape from Black Friday 2017 - Dead Horse Bay aka "Bottle Beach"
Let's escape down this lacy tunnel of trees! and on to the shore - they'll never find us here! This year's Escape from Black Friday was a pretty laid-back one. 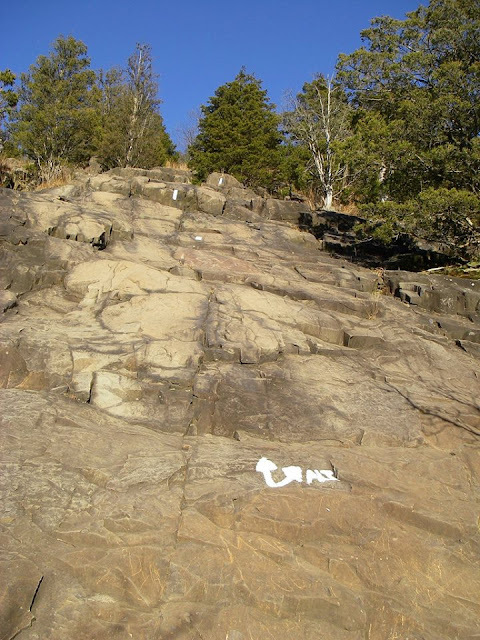 The "sample escape route" shown in the last post can be found in Sleeping Giant State Park, a favorite hiking location for TQ and me, but one that's far enough away from NYC that we mostly only go when we're staying in CT (where TQ's mom lives) overnight for a holiday. This year, we made a day trip of our Thanksgiving, returning to Brooklyn after a wonderful dinner with his mom and other family from the area. We weren't very quick to get going the next day; we briefly mulled over the idea of doing a little exploratory trip for a hike on the Staten Island Greenbelt Trail, a hike that might be quite suitable for one of Sebago's off-season hikes, but with sunset now being at 4:30 in the afternoon (blech), and us not knowing exactly where the trailheads are, we scratched that in favor of just running on out to our favorite old local hiking standby, Floyd Bennett Field, part of the Jamaica Bay unit of the National Park Service's wonderful Gateway Recreation Area. We usually hit the North Forty Natural Area for short hikes like we had in mind, but I thought it would be a nice switch to do the Dead Horse Bay loop instead. I was guessing that the tide would be fairly close to low and although these days I pretty much have enough old bottles for the available windowsill space (although room can always be made when I find something that's particularly eye-catching, as of course usually happens), I always enjoy beachcombing here, there's just so much weird and interesting stuff to look at if you've got the time, which we did. Dead Horse Bay got its name from the horse rendering plants that were the main industry in this part of NYC back when the horse was the city's main means of transportation; after a horse carcass was broken down for its useful components, the chopped-up bones were dumped in the bay (sorry to all the horse lovers out there, I'm rather fond of 'em myself and I know that's not a pleasant picture). After the adoption of motor vehicles rendered the rendering industry obsolete, the city began using the area for a landfill; the landfill was capped at some point but the cap broke and now decades of early 20th century garbage steadily leaks out onto the beach. * Bottles, shoes, celluloid toys, knick-knacks, china and pottery, bits of hexagonal tile floors, all sorts of stuff. People love to come here to see what they can find - some people just look, some people bring bags to take treasures home, some people enjoy making little or not-so-little arrangements for others to enjoy. We've usually come here by kayak, but it was kind of interesting coming by land and walking a bit more of the beach - TQ spotted an eroded bank which was full of the debris that eventually ends up on the beach, and he also spotted a point in the bank where the breach in the landfill just ends and the bank is suddenly clean, pale sand (you can see that in the last photo). All in all a very pleasant, low-key Escape from Black Friday on a very beautiful day. Click on any photo for a slideshow! *Atlas Obscura has a good article about Dead Horse Bay - I basically knew the history of the area, other Sebago paddlers have told me the story behind the name and why all the bottles and stuff are there, but I did do a little googling just to make sure I'd heard it right. Happy Thanksgiving/Don't Forget To Escape! Sunny, with a high near 50. West wind 6 to 9 mph becoming south in the afternoon. Perfect weather for an ESCAPE FROM BLACK FRIDAY. Here is a sample escape route. This is an especially fine one, and yours may not look exactly like this, but any escape is a good one! American Princess trip 11/5/17 continued - "Thar She Blows!" Yesterday's post about what I did when I got to the whalewatching boat really, really early on November 5th ended with ""One good urban wildlife sighting down - hello Princess, let's go find more! ", and that's exactly what we did! It was a wonderful day out on the water, gray and ever so slightly drizzly, as the forecast had said, but in that way that I actually find very atmospheric, with constantly shifting layers of clouds and fogs. There were so many birds, lots and lots of gannets doing their spectacular dives (everybody loves menhaden) and gulls, plus speeding strings of the winter ducks who are arriving from their northern breeding grounds around this time of year. The rain had probably kept a lot of people home, so the boat wasn't too crowded, which is nice for the passengers who do make it. There were a couple of particularly interesting things that went on on board, but I'll do another post about those. The water was so quiet inside Breezy Point, then got very bouncy as we left the shelter of the Rockaway Peninsula. It took a while to find the whales, but I was enjoying relaxing and watching the scenery and the birds as we headed east along the coast, and, finally after a couple of hours, a pod of dolphins was spotted -- and instantly forgotten when the captain sang out "There she blows!". We spent the next hour or so (I think, I stopped looking at my watch once we found the whales) admiring five or six or maybe even seven humpbacks. Absolutely wonderful! Here are more pictures from the day - click for a slideshow view. Looking forward to another trip this coming weekend, hope the whales come out to be admired again! Want to learn more about these big-city cetaceans? Visit GothamWhale.org! And speaking of whales - the work situation has continued to be such that I'm lagging behind in the blogging. Heck, I still haven't finished my Colorado blogging from May, but I'm not skipping that far back today -- that'll make some great fill-in posts on days over the winter when it's too yucky to do anything outside. Nope, today I'm just going back to the first Sunday in November, when I finally made it out whalewatching for the first time in 2017. Work's been crazy, TQ's schedule a little unsettled, I've been running around entertaining myself on weekends as an antidote to the work stress, the list of things that needed to be taken care of on the first possible quiet day at home was getting longer and longer. And then here came November 5th, and I didn't have anything to do, and TQ was going up to CT to help his mom out with some stuff at home (he's a good guy that way), so there it is, the much-needed possible quiet day at home, so of COURSE I do the only sensible thing and buy a ticket to go whalewatching! Well, it was being billed as the last trip of the season (they did end up being able to add the 3 days after Thanksgiving, but that was totally a bonus) and the stuff at home was basically all stuff that could wait. The weather forecast for the day wasn't great, 40% chance of showers, but it wasn't too cold, I have good clothes for bad weather, and the American Princess has plenty of covered deck areas where you can watch even if it's raining (btw they aren't giving me anything for these plugs I give them, this is purely a hobby blog and unless otherwise mentioned, anything you will ever see plugged here is just being plugged because I think it's neat), and sometimes less-than-perfect weather is a good thing for boat stuff because you just won't have the crowds. Well, you know you've made a good call when you go to go whalewatching and have already had fun and a really good wildlife sighting before you've even boarded the boat! The week before, they'd sent out a reminder on Facebook that November 5th was also the day of the NYC Marathon, and to leave lots of extra time for marathon-related traffic delays. I was taking the Q35 bus, which runs back and forth between my neighborhood in Flatbush, Brooklyn, and the Rockaway Peninsula in Queens - the farther reaches of both boroughs, and not somewhere the marathon comes anywhere close to, but you never know what kind of weird domino effect an event of that size is going to have on above-ground transportation, so I think I left 45 minutes before I needed to, just to be safe. It wasn't at all necessary, everything was running exactly the way it was supposed to and I was at Riis Landing at something like 10:30, with the boat departing at 12:30. So I had some time to kill and decided to spend it with a bit of a walk on the Gil Hodges Memorial Bridge. I've paddled under this bridge more times than I can count, I've been across it a few times in a car or a bus, but I'd never walked on the walkway and I thought that might be fun. And it was! Nice views of the marina at Riis Landing, fun looking down at the swirls as the ebb tide ran around the bridge footings, and at the fishermen working the eddies down there, fun taking some pictures of the bridge from a different angle after taking countless photos of it from down below, and best of all, I spotted one of the peregrine falcons! There's a nesting box on the south tower of the bridge, which I've known about for a while, and that was where I walked to; I wasn't entirely expecting to see one of the falcons, but as I was approaching the tower, I could see a bird perched on one of the stairway landing for workers climbing the tower. Didn't have a great view of it, but as I got closer I could clearly see that it wasn't a seagull or a pigeon, no, it was a much less common silhouette! I stayed there for a little bit longer and then decided it was time to head back to the American Princess. Gray day, yes, but it was off to an excellent start. - The towers hold lift machinery and the section between them raises and lowers vertically to allow large vessels access to and from Jamaica Bay. The center span lifts from 55 feet above the water (doesn't say low or high but I'd guess clearance is measured at high) to 150 feet. - At the time the bridge was built, it was the longest vertical-lift span for automobiles in the world. - The bridge connects the Floyd Bennett Field and Riis Park units of the Gateway National Recreation Area, the amazing national park that covers so much of NY harbor, including the Sebago Canoe Club's NYC home, Jamaica Bay. "Gateway Is My Getaway" - perfect slogan I stole from John D., head ranger at Floyd Bennett and also a fellow J-Bay paddler. - The bridge was named for notable NYC baseball figure Gil Hodges. Baseball fans will probably know who he is, but for the rest of us - he played first base with the Brooklyn Dodgers, finished his playing career with the NY Mets in Queens, and then managed the Mets from 1968 until his early death by heart attack at the age of 47 in 1972. The 1969 "Miracle Mets" won the World Series on his watch. The bridge was named in his honor in 1978. More pictures from my pre-whalewatching mini-hike. There are captions this time but click on any photo for more detail. Looking in towards Jamaica Bay, where 90% of this blog is set. Approaching the south tower of the bridge - hey, that's not a gull! Nope, not the best view ever but that is a peregrine falcon. Very neat sighting! More fishermen - fun seeing kayaks from up here! Back on shore at the marina. Sculpture left from an art in the parks event a few years back, according to Catherine Granton, one of the Gotham Whale naturalists. I used a black and white version of this for the Facebook black and white challenge and a friend asked if it was a memorial. I had no idea but Catherine had the answer. One good urban wildlife sighting down - hello Princess, let's go find more! No, these aren't whales - but they're very important to whales. Interesting news week for whales in NYC and elsewhere along the east coast. Just a few links to share tonight. Artie Raslich, Gotham Whale's fantastic photographer, goes out regularly during the week to shoot pictures from his own boat. He was looking through a set of photos recently when he noticed that the whale was entangled in fishing gear. He made a couple of calls, and on Sunday the 12th, a qualified team from the Center for Coastal Studies came to try to help. Artie was able to follow them in his own boat and shared the photos of the attempt on his blog. Click here to view. So much patience (from both the rescuers and Artie). 2nd story, also from Artie, this time actively trying to help herd a whale out of Reynolds Channel, the next inlet east of NY Harbor. There's a railroad bridge that the whale somehow got past coming in (maybe chasing a school of menhaden) but seems nervous about re-negotiation to get back out to sea. Fingers crossed for a happy ending to this one. Update - sounds like "Reynolds" has made his way back to open water. Hooray! 3rd story - the American Princess has added 3 more whalewatching trips after Thanksgiving. I went out on their trip on the 5th (will post about that soon, it was amazing, the captain and crew had to search for a while but finally found us a whole pod, 6 or 7 whales, and so much bird life out there while we were looking! ), which was supposed to be the last one for the season, but the Gotham Whale folks mentioned that if the boat's annual Coast Guard passenger vessel inspection went smoothly they might add a few more. All must have gone well, because earlier this week, they announced 3 additional trips, one each on the 24th, 25th, and 26th of November. They've had a great season, still amazes me that we have all these whales who are amenable to being respectfully watched right here in NYC. In the NY area and want to give it a try? Click here to visit their site, and visit Gotham Whale to learn more about our local cetacean population. BTW if you are a local boater, you can help Gotham Whale study our local whales, dolphins, and seals; click here to report sightings. In news of people being less helpful to whales - I was waiting eagerly to hear the results of a vote that was being taken by the Atlantic States Fisheries Commission concerning the management of menhaden, the small and oil-rich fish that is a major food source for our local maritime predators, from whales and dolphins to stripers and blues to gannets and egrets and osprey (oh my). Those are menhaden (aka bunker) in my photo above, taken in Jamaica Bay. These aren't a food fish for humans, but they do have uses that can make money, so there's a fishery. This week's issue was one of managing that fishery. The NY Times wrote what I thought was an excellent opinion piece describing the situation. Click here to read. I wondered all week how the vote went and finally found out today via a post to the Facebook group Church of the Double Bladed Paddle. The results? Could have been worse, but also could definitely have been better. Hopefully the communities that signed petitions in favor of the management plan that was turned down can keep tabs on the situation until 2019. Click here to read the report, from Rhode Island Public Radio. Just a quick picture post today. Life continues to be overscheduled for me, swinging back and forth between grievously and gloriously so (weekends have been spectacular, work weeks not so much...), and TQ's got a lot going on too, but we managed to grab a Saturday together this weekend and escaped the crowds and the noise for one splendid afternoon to ourselves. Click on the first photo for a slideshow view, and click here for more about the Sandy Hook unit of the Gateway National Recreation Area.